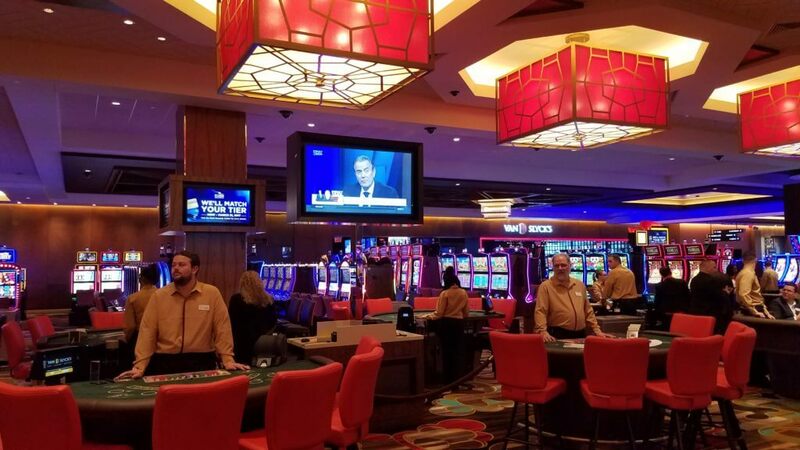 SVT recently completed the installation of Rivers Casino digital signage, video distribution, audio and control systems in time for its grand opening in February. SVT designed and built the digital video and signage solution consisting of an IP streaming video distribution system that Rivers Casino uses to manage and share high quality video across the casinos 147 displays. The IP streaming distribution system allows any signal from the head end to play on any display in the facility so that they can choose between digital signage, satellite/Cable TV feeds, or live broadcast of entertainment or other special events to any of the single displays or to a 3 x 3 video wall capable of showing one large image or 9 individual images or many other configurations. “We worked closely with the Rivers team to understand their exact functional requirements,” says industry veteran Mike Kupfer. “Most notably, we were able to deliver an SVSI streaming distribution system for video . This IP based system allows expansion in the future without adding a head end component.” The audio and video systems are controlled by Crestron with 18 wireless iPads IP touch screens through out the facility. In addition, SVT designed, provisioned and installed a Harman HiQnet BSS audio system using crown amplifiers and a Dante Streaming audio distribution system, consisting of 480 speakers with 31 zones. The speakers are equipped with ambient noise sensing microphones that automatically adjust the volume – eliminating the need for manual adjustment by staff. Rivers Casino & Resort project including 50,000-square-foot gaming floor with 1,142 slot machines, 67 gaming tables and 15 poker tables attached to a 165-room hotel and a 10,000-square-foot banquet facility capable of hosting up to 900 people for conventions and special events, one of the largest spaces in the region.